I admit to being half-hearted about collecting this genus, simply because all the species I find are introduced from outside North America, and are heavily studied in their native ranges. Still, it’s interesting to find exotic species on mountain slopes or along desert streams, having adapted to a new place, and settled in well. 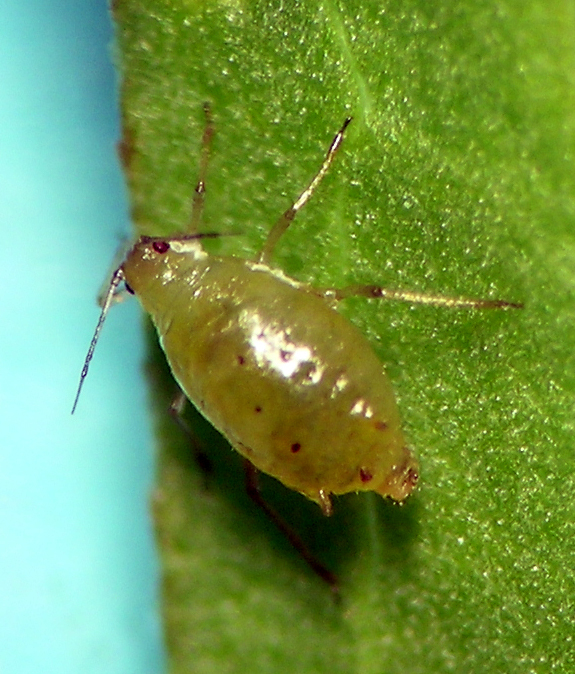 This is an aphid that many lay-people and gardeners may have seen, living on weedy thistles in their gardens, farm fields, pastures, and the like. It is usually attended by ants, and builds to very dense populations on its hosts. It is known from many genera of plants throughout its range (most of the Northern Hemisphere), but my collections are all from its primary hosts in the genus Prunus (Rosaceae) and various Asteraceae (including thistles – Cirsium). Brachycaudus cardui on thistle on Orcas Island in the San Juan Islands of Washington. 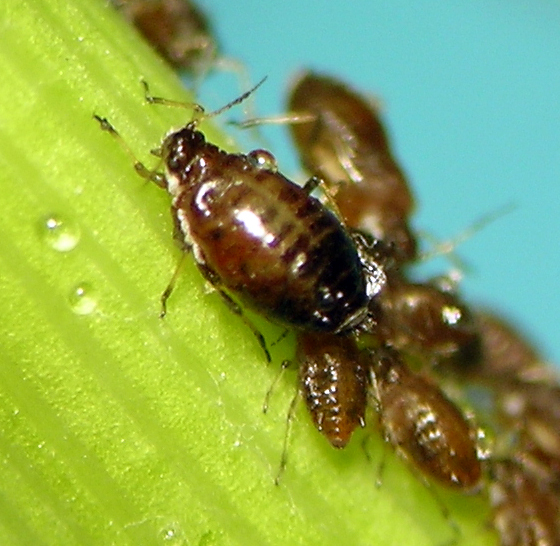 Here is another of the many widespread pest species introduced to North America from elsewhere, Europe in this case. It has invaded all kinds of agricultural areas, urban settings, and native habitats from coast to mountains. It is especially common on a range of Asteraceae. From my earliest years in aphid studies, I remember seeing it nearly overcoming Conyza canadensis in the Columbia Basin of Oregon and Washington, eventually supporting huge populations of lady bird beetles and other predators. In the cooler climates where I have lived, this species migrates between Prunus and all of its many summer hosts. Brachycaudus helichrysi on its primary host, Prunus, near Boise, Idaho. Like nearly all Brachycaudus in North America, this is another invasive species. It is one of the rare instances in which Blackman and Eastop has not been updated to reflect the full range of a species. I have been collecting this aphid for over 20 years, and seen it many places where I did not collect it. It is known to be monoecious on Tragopogon, and it seems to be so in my area, but it gets a very early start in the spring. Sometimes I have seen colonies on the rosettes of its host plants incredibly early in the season, such as 1 March in Moses Lake, Washington. I therefore wonder whether this aphid overwinters as viviparae in the western U.S. I have material from Washington, Oregon, California, and New Mexico. Brachycaudus tragopogonis from central Washington.